Wood Baskets & Coal Buckets. Flue Pipes & Flue Liners. 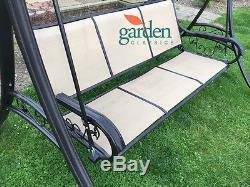 LARGE LUXURY RIMINI GARDEN PATIO METAL FRAME SWING SEAT NEW. 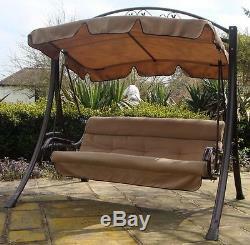 INNOVATIVE LUXURY RIMINI GARDEN SWING PERFECT FOR THOSE LAZY SUMMER AFTERNOONS &##xA0. &###xA0;&###xE2;&###x20AC;&###x201C;Garden swings and hammocks may differ but these are suitable for adult use as we also just&###xA0;love to take time out for ourselves too. Taking a&###xA0;break from gardening or just your everyday woes, you can get a plenty of relaxation on this comfortable swing. For kids: &###xE2;&###x20AC;&###x201C; Garden swings and hammocks are always a lot of fun. But then what a great place to take a shaded nap in the fresh air too. This superb patio / garden swing has a durable dark copper brown coloured powder coated heavy weight steel frame which sturdily bolts together making strong frame with a footprint measuring 220cms wide x 157 cms deep. Four large polypropylene shoes are fitted to the frame to protect patio surfaces. The swing frame measures 200cms tall. And swing bench measures 173cms wide and is decorated with forged flowers and scroll insets in the sweeping head frame and bench armrests. The beige roof canopy and upholstery are made from quality woven 160g/m2 polyester fabric covering a deep fibre filled cushion. 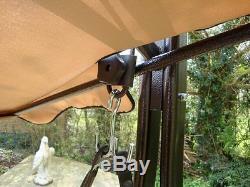 The roof canopy&###xA0;features a handy&###xA0;tilt adjustment&###xA0;ensuring&###xA0;an optimum shady spot for your rest. There is also a small amount of rake adjustment for the bench seat. Removable seat cushions with waterproof textaline sub-base. Limited numbers&###xA0;remaining for this season. P & P From &###xC2;&###xA3;21.95 available to UK mainland addresses see table below. Mainland England & Wales, South Scotland, Isle of Wight. Grampians& Highlands - Postcodes AB31-56, FK19-21, IV1-56&##xA0. Off shore Islands, price on application&##xA0. Portugal, Spain, Austria, Italy, &##xA0. Switzerland, Gibraltar, &###xC2;&###xA3;25 Duty&##xA0. &###xA0;UK Deliveries 1-3 days&##xA0. Rest of Europe 3-5 days N/A. 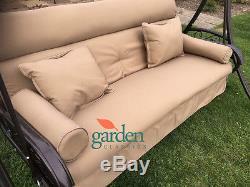 This item would sell in garden centres for well over &###xC2;&###xA3;375. DELIVERED BY FULLY INSURED COURIERS. Jakana Trading Co Ltd opened its doors for business early in 2002 and has grown rapidly to become a successful online retailer of items for your home, garden, workshop and leisure. Viewings / Collections by appointment, please call to arrange. Our regular courier collections ensure that they are in your hands in the fastest possible time. We believe very strongly that we should treat every customer in just the same way that we would like to be treated and so this is what we always aim to do. As this is our full time business we are in a strong position to always be here if you need questions answering or if you need customer service. All prices quoted include VAT where applicable. We accept payments by: Credit or Debit Card, simply call one of our sales team on 01296 836836 Monday - Friday 9.30am - 5.00pm. Sorry but we no longer take cheques as these just take too long to clear. Please allow extra time for clearance if you are paying by Echeque. Please do not tag messages onto any other communications as these seldom get seen. We are committed to your satisfaction, we inspect every item prior to dispatch to ensure that it reaches our own high standard of quality, and that you receive the item as described. This can sometimes be achieved by removing components from the packaging to reduce some of the weight however. We pride ourselves on our customer service. For more information see our Full Terms & Conditions. You have 14 days from cancellation to return the item to us. This listing is currently undergoing maintenance, we apologise for any inconvenience caused. 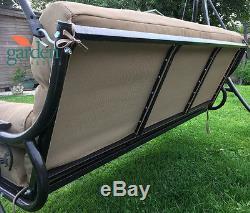 The item "LARGE LUXURY RIMINI GARDEN METAL FRAME SWING SEAT FREE SCATTER CUSHION SET INC" is in sale since Tuesday, August 22, 2017.